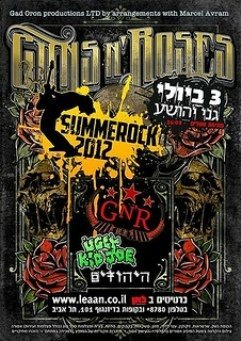 On Tuesday, I told you that Axl Rose and Guns ‘N’ Roses were playing in Tel Aviv, Israel that night. 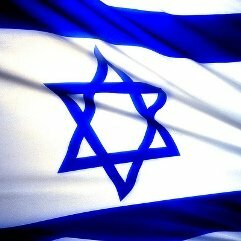 Here is video of them playing the Israeli National Anthem, “HaTikvah [The Hope],” on electric guitar. Very cool. The song is followed by “Don’t Cry” with Axl Rose singing. The guitarist is Guns’N’Roses’ Ron “Bumblefoot” Thal, who is Jewish. Watch this very cool video. An eye still watches toward Zion. Not a GNR fan, but I have to take my hat off to them for ignoring the boycott and performing in Israel. Did you ever ask your mother why she married her brother? And you know what is racist? Those who want ackowledge one Jewish country out of 220 countries in the world, but have no problem with 60 Islamic Countries, 100 Christian countries, Buddhist countries, etc. Jon…. he doesn’t like Jews? Well that’s his affair. He can keep his bigoted views to himself. There’s no trick to finding Jews who will advocate hatred for their fellow Jews. 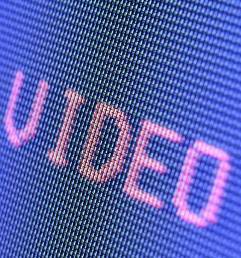 The video is meaningless. Israel exists. The Arabs don’t like it. The mere fact that someone can find a video of Jews advocating for an Arab State in place of Israel doesn’t really mean anything. If such Jews were a majority consensus of Israeli public opinion, we would see that implemented in Israeli government policy. So the whole post and its associated link is just an incitement to hatred toward Jews. It says that Jews have given “license” to hatred of Israel. It’s not true and the person who posted the video knows it. Hey troll who posted at “5:33 pm”, thanks for showing your true colors of anti-semitism and also thanks for showing your demagoguery on the “Rima Fakih” thread as well. Either show some damn respect, make some friggin sense or shut the hell up and go away and don’t show yourself here ever again! I love Rock ‘n’ Roll! Er, that is, I love the stuff I grew up listening to on the radio, way back in the late ‘Fifties and early ‘Sixties, i.e., the stuff I like to sing. But, this modern stuff – – – ? Shucks, I never did like the crowds and the marijuana. I reckon these guys are good at what they do, but these ears of mine can’t discern the individual sounds among the distracting confusion of all the other noise. I can’t understand what it is they’re singing. Well, I can’t understand what the Mormon Tabernacle Choir is singing, either, because I’m unable to clarify the sound of massed voices – – – , and I’m a Mormon who knows their songs. I can only understand and appreciate ONE (01) lone singer at a time, IF there’s no cheering crowd to mess things up. That’s why I hate watching live performances on video, or listening to live performances on a CD. I wish recording studios and performing artists wouldn’t do that. And, of course, being an amateur singer/songwriter living out my rapidly declining years all alone in a military retirement home – – – ? Heck, YEAH, I’m JEALOUS that I ain’t got good looks, fame, fortune, and bevies of adoring females, along with a couple of harems located in far flung ports of call! Hey, folks, go to MY web site and watch the full length Hollywood movie, “CAST A GIANT SHADOW”, along with OFFICIAL videos of today’s Israel Defense Force, plus videos of ME(! ), strumming chords on my guitar as I sing about the land of Israel. Just click on my name, and it’ll automatically take you right over there. JRM, that was a very interesting post. I’m a musician who finds himself in a similar predicament. I love harmonies but always preferred the sparser vocals over the closely bunched up ones. I hate (OK, envy) the people who can sing perfect harmonies. To me it’s just a big mess of vocals, just one huge voice. I like some Jazz, for instance but the most ejoyable Jazz recording I ever heard was a simple drums, bass, flute combo. Three totally different instruments each with it’s own unique voice. Stick all the horn and woodwind sections in there and I’m lost in a jungle. Kay, Spoken like a true low-life. Kay, you’re lower than whale sh**. And prolly a Moooslim which is redundant! What ever happened to “Slash”? He was known to be of Jewish ancestry. @NO Santa Clause – Axl and Slash had your typical rock n roll falling out. I’d love to see these guys live, but their perpetual lateness is a turn off. Glad to see another artist say screw the PCness and perform in Israel. I don’t get it. I don’t waste time posting on Islamic or Neo-Nazi web sites. Why do these idiots insist on posting, or even reading, Debbie’s site, when they know they will dissagree with everything they read in advance? Do these people really have nothing better to do? They should get a hobby! The big question should be: would Slash or Buckethead have played it better? Ha-ha. Stupid Mooooslim/Liberal head-explosions are annoying but the other side of the coin is delighting in how CrAzY the FACTS make them. They can’t argue against the TRUTH so they are reduced to ad hominem to ease their empty and aching mind! LOVE. IT! I know it started off kind of slow, but it seems that the people started getting into it more as time passed. 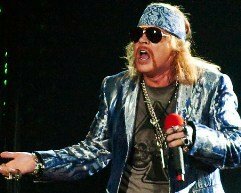 Sound quality could have been better, but I guess you really can’t expect much, but I do agree with John on July 5, 2012 at 5:07 pm, ‘Not a GNR fan, but I have to take my hat off to them for ignoring the boycott and performing in Israel’. Slash was only half non-shellfish eater…. The Saudis are concentrating on the Blacks now. They can run for congress and they can win by color not by ideas. Thus they are building support for themselves in the congress to impose Islam on America. Wake up America before it is too late. These pernicious people have mastered the art of treachery and deceit and they will get to their goals by applying their lies. By the way Muhammad said in a hadith;; When you see the Blacks rule the world it will be the end of the world. But they never tell the Blacks this. Leave a Reply for ??????????????? ?